This chapter provides a review of the role of the media in constructing and reinforcing stereotypes and discriminatory attitudes toward older Australians. watching movies including renting, downloading, streaming or going to the movies at a cinema. those living with a partner without children are significantly more likely to read newspapers (76%) compared to those who live alone (61%) or those who live with children (67%). There also appears to be some link between the consumption of social media and negative attitudes. Those who are more likely to be classified as holding predominantly negative attitudes (including younger respondents, university graduates, and full time workers) are also more likely to be accessing social media (such as Twitter and Facebook), when compared to those who are not classified in this manner. Findings from the audit of social media identify that peaks in social media discussion about older people are focused on reports of older people as the victims of crime, or as otherwise physically vulnerable or at risk of illness. people aged over 55 were referred to in 11.5% of the editorial media content. Given that in 2012, people aged 65 or more made up 14.2% of the Australian population and people aged 55 or more made up 25.6%, this analysis indicates that older people are invisible in the media relative to their presence in the population. Almost all participants in the focus groups felt that the media has an impact on attitudes and behaviours and many felt that the impact is negative. Others also feel that personal experience reinforces positive opinions of ageing and old age, while negative perceptions are often reinforced through the media. The main example given in relation to this interaction is the perception that older people are more likely to be victims of crime. Most who feel that this statement is true do not personally know an older person who has been a victim, although all have seen stories in the media and feel that victimisation is a common occurrence. In contrast, their reaction to the stereotype that all old people are the same is vehement in its rebuttal, simply because their grandparents had been interesting, different, fun etc, and different from other older people they knew. Personal experience with someone older overcomes the issues of homogeneity and invisibility discussed in relation to the media. the perceived Australian ‘youth culture’. Across all negative attitudes, personal experience, stories seen in the media and stories read in the media are the strongest contributors. While influences including cultural background, educational attainment, colleagues and Australia’s youth culture do have some impact, this influence is muted, with generally less than one third of respondents feeling that these aspects have an influence on their attitudes about older people. In line with findings from the qualitative phase (focus groups), across most attitudes, personal experience is considered to be the main driver behind attitude formation in most instances. This is particularly the case with attitudes related to cognitive deficiencies of older people, where more than seven in ten respondents feel that their personal experience has contributed to their beliefs about older people. While findings from the media scan do not indicate a skew toward stories focusing on the negative cognitive abilities of older people, discussions during the qualitative phase indicate that commercial programming (particularly drama series) is often seen to show older people as forgetful. As such, there is some scope for the media to assist in breaking down these attitudes by providing alternative views of ageing in commercial programming. Findings from the media scan confirm that a considerable volume of media content focuses on stories which portray older people as victims – ‘unknown’ older people were most often mentioned in the analysed news and current affairs coverage as the victims of crime. 52% of those aged 18-54 years agree that older people are more likely to be victims and there is evidence that this negative attitude is driven to a considerable degree by the media. Lonely and isolated: The perception that older people are lonely and isolated also appears to be heavily influenced by media (both print and visual), although personal experience also has a role to play. Six in ten (63%) of respondents feel that stories they see in the media have an influence on their perception that older people are lonely and isolated and a similar proportion (60%) feel that stories they read in the media have an influence. However, two-thirds (65%) also feel that their personal experience has contributed to their belief that older people are lonely or isolated. This is in contrast to the findings from the media scan. In both mainstream news media and advertising, older people are rarely presented as isolated, alone or lonely. In news media, they are almost as likely to be pictured in a social or public setting as in a domestic or private setting. However, findings from the qualitative phase show a strong link between the concepts of physical frailty, victimisation and the concept that older people are isolated and lonely. In many ways, one results in the other from a participant view – if an older person is afraid of being victimised or if they are too frail to leave the house, then their ability to socially engage is directly affected. More likely to be sick: Personal experience and the media have a strong influence on the perception that older people are more likely to be sick. More than half (58%) of respondents feel that stories they read in the media have an influence on this perception and a similar proportion (61%) feel that stories they see in the media have an influence. Personal experience is most likely to influence this perception, with 68% stating that this is influential in attitude formation. Findings from the media scan indicate that media coverage does skew toward a portrayal of older people as sick and vulnerable. Mainstream news media content most often presents older people as passive, vulnerable and frail and these traits were frequently associated with older people in the contexts of ill health. Peaks in social media discussion of older people are similarly focused around reports of older people as physically vulnerable or at risk of illness. There is perceived influence of the media on perceptions that older people are more likely to be sick and 36% agree that this stereotype is an accurate reflection of the older population. Are bad drivers: 62% of respondents feel that media they see has an influence on their perception that older people are bad drivers and the same proportion again (62%) feel that media they read has an influence. Personal experience also plays a role, with 73% feeling that their experience underpins their perceptions of the driving abilities of older people. The media scan indicates that coverage of accidents in relation to older Australians is notable and that traffic accidents are often a focus of this coverage. While it is not possible to confirm whether media stories related to traffic accidents place older people at fault, there is scope for the media to assist in the breakdown of this stereotype by reinforcing the positive traits associated with elderly drivers. a perception that older people complain a lot: 53% feel that stories they read or see in the media have an impact on their perception that older people are likely to complain. Question: Thinking about how younger people view older people, how much of an influence do the following have on these perceptions. Base: All who indicated they ‘agreed’ or ‘agreed strongly’ with specific attitudes (varies by question). Bold figures: Highlight stereotypes where more than 50% of the community sample feel the media has contributed to their perceptions about older people. Business respondents were asked about the overall influence of different information sources as opposed to the influence of these sources on specific attitudes. Findings from business participants can be seen in Figure 8. As with the broader community, personal experience is the strongest driver of perceptions of older people, with 65% of all businesses either agreeing or agreeing strongly that their experience has influenced their perceptions. Education is the second most influential factor, with 43% feeling that this has an influence. Around one third of business respondents feel that cultural background (34%) or work colleagues (33%) have an influence on their perceptions of older people. Business respondents are least likely to feel that stories they see in the media (15%), stories they read in the media (15%) or advertising (14%) have an influence. There are few differences by demographics in perceptions of influence for business respondents. Question: Thinking about how younger people view older people, how much of an influence do the following have on your perceptions. Base: All business respondents (n=504). To understand how respondents perceive media and advertising portrayals of older people, all respondents were asked to think about everything they had seen and heard in media and advertising and to describe words most commonly used to portray older people. The findings for media generally, and advertising specifically, are provided below. Figure 9 presents the themes most commonly mentioned by respondents in relation to the portrayal of older people in the media generally. Descriptors associated with negative portrayals of the cognitive or physical capabilities of older people are often mentioned, with many respondents feeling that the media portrays older people as forgetful, frail, slow, fragile, sick or grumpy. These findings are reflected in the media scan, where ‘unknown’ older people are most often seen to be portrayed as frail and weak, as victims of crime or as in poor health. There is also a correlation between perceived portrayals of older people in the media and the most commonly held negative attitudes in relation to older people. This reflects the potential influence of the media identified in section 4.3. 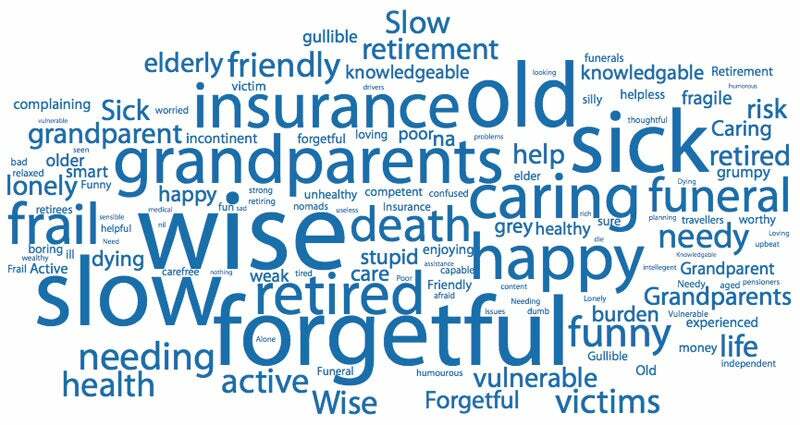 Respondents are most likely to agree that older people are forgetful and vulnerable, aligning with the most commonly used descriptors for the portrayal of older people in the media. These findings suggest that community members are taking on board the portrayals currently available in the media and that this portrayal may be influencing deeply held attitudes about older people. There are no real differences in perceptions of media portrayal between business and the broader community. The size of each word is directly proportionate to the number of mentions of that theme. Question: Thinking about everything you see and hear in the media (including on TV, online, on the radio and in newspapers and magazines), how does the media portray older people? Critically, when asked whether the portrayal of older people in the media is a fair representation of the older population in Australia, more than half (61%) say that it is not. This suggests possible misalignment between how community members view members of the older cohort and how the media portrays older people. There are relatively few demographic differences in relation to those who feel that the media portrayal of older people is not fair. This perception is uniform across almost all sub-groups. However, those classified as holding predominantly negative attitudes are less likely to feel that the portrayal is unfair (54%), when compared to those with more positive attitudes in relation to ageing (64%). Older respondents (65+) and CALD respondents are also more likely to feel that the portrayal is unfair when compared to younger and non-CALD respondents. there are enough older role models portrayed in the media (16% agree, 45% disagree). 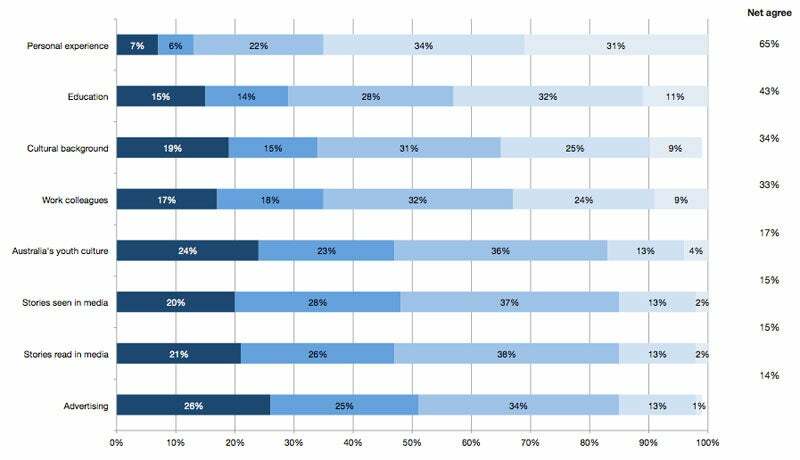 Older respondents are consistently more likely to disagree with all statements and the findings for business respondents are in line with those observed for the broader community. respondents who think that the portrayal of older people in Australia is a fair representation are significantly more likely to agree with all three statements compared to those who do not think the portrayal was fair. Linked to findings from the media scan and qualitative research, community respondents are most likely to feel that the unfair representation of older Australians is a result of a lack of diversity of older people in the media (21% of all those who feel the portrayal is unfair). A further 10% feel that the unfairness is a result of media stereotypes and similar proportions feel that unfair portrayals are the result of a lack of focus on the contributions older people can make (9%) and the fact that older people can still be healthy and active (8%). The perceived portrayal of older people in advertising appears to differ from that of the broader media (see Figure 10). While aspects of cognitive and physical deficiencies continue to feature, descriptions of products specific to the older audience are also present (including insurance and funerals). Interestingly, positive descriptors such as happy, caring, funny, wise and active are more likely to be associated with advertising than with the media more generally. Victimisation is less frequently mentioned for advertising than it is for media more generally. There is little variation between findings for business and consumer audience. Question: Thinking about advertising that you have seen (including on TV, online, on the radio and in newspapers and magazines), what three words describe how older people are portrayed in advertising? When asked whether the portrayal of older people in advertising is a fair representation of the older population, almost half of all community respondents (47%) said that it is not. A higher proportion of business respondents do not feel the portrayal in advertising is fair (65%). This supports the conclusion that there is a misalignment between how members of the community see the older cohort and, in this case, how advertising portrays older people. Again, reflecting the findings from the media scan and qualitative research, community respondents are most likely to feel that the unfair representation of older Australians is a result of a lack of diversity of older people in advertising (19% of all those who feel the portrayal is unfair). A further 15% feel that the unfairness is a result of a lack of focus on the fact that older people can still be healthy and active. 8% feel that the unfair portrayal is the result of an overly rosy image of ageing, 7% feel that it is a result of a focus on funeral advertising. As with perceptions of the media, there are relatively few differences by demographic and sub-group about the fairness of advertising portrayals of older people. Again, those classified as holding predominantly negative attitudes are less likely to feel that the portrayal is unfair (39%), when compared to those with more positive attitudes in relation to ageing (48%). “Just as they are – a diverse group with interests other than superannuation, insurance and funeral plans”. “As a true cross-section of what is the reality. Interviews of ‘famous’ elderly and victims is not a true cross-section”. “As diverse. You do have frail, doddery old people – there’s no escaping that fact. There are also some that are active and alert until they die suddenly at the age of 103”. “Just like young but with more wrinkles”. “To be portrayed for who they are, not how old they are. They cannot be painted with the same brush so to speak”. “The same as any other social group – many great things to offer, and some not so great! Realistically so to speak”. “Like everyone else. Age doesn’t need to be factored into it”. “As being capable of contributing, being active, interested and willing to participate”. “Intelligent people who can still contribute – either in business or with the family. More recognition of the skills they can contribute”. “More focus on the different roles that older people are engaged in. How many older people, though retirees, are called on to support their families”. “As people that know a lot about a lot of things and could teach young people and help them by passing on what they know”. “As people who contribute to society, from still being in the workforce, to charity or community work, not just lazy, retired people”. “While some older people are fearful, a lot are not. I believe that older Australians are often influenced by the media, which means that they are often “made” to be fearful by inaccurate reports, which then becomes a cycle of fear”. “In a positive way. We do see from time to time, but I love to see elderly people that study or still play sport rather than those that can’t pay their electricity bill. I do feel for those people but they also need to be seen as a positive influence on the community too”. “More happy and loving towards their families. Also, my grandparents have an iPad each and a DS each, so they need to be shown on ads using technology”. Deloitte Access Economics, Increasing participation among older workers: The grey army advances (2012), p i. At http://www.humanrights.gov.au/age/publications/mature_age/index.html. Australian Bureau of Statistics, Population projections, Australia, 2006 to 2101, Catalogue no 3222.0 (2008). At http://www.abs.gov.au/ausstats/abs@.nsf/Latestproducts/3222.0Main%20Features12006%20to%202101?opendocument&tabname=Summary&prodno=3222.0&issue=2006%20to%202101&num=&view=. Advisory Panel on the Economic Potential of Senior Australians, Government responds to the Final Report of the Advisory Panel on the Economic Potential of Senior Australians (2012). At http://archive.treasury.gov.au/EPSA/content/publications/government_response/contents.asp. Note: in the budget papers this project is referred to as: Economic Potential of Senior Australians – countering negative stereotypes and promoting positive media portrayal of older Australians.